RunGuard automatically checks a file before execution. RunGuard uses its own ScriptCheck technology to determine if a file is useful or harmless. 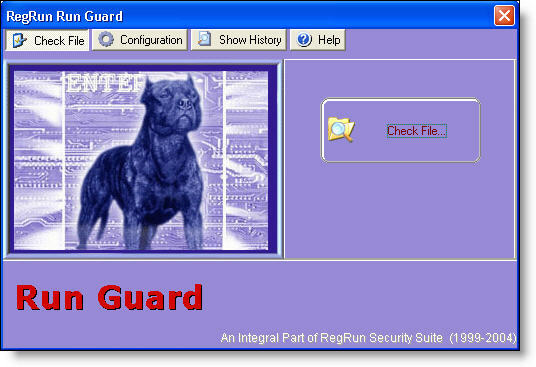 RunGuard can check Microsoft Office files, HTML files, Windows script and batch files. When RunGuard has found a suspicious code in a file it alerts you. You can stop this file from running, check by antivirus, block running of this file, quarantine this file, delete or get more information. Also you can even "Cure this file" by stripping the dangerous code from HTML file or launch it safely to view contents. RunGuard allows you to keep log files, executed on your computer. RunGuard can prevents a file from run using Windows Explorer. Open RunGuard, go to the Configuration, Forbid to Run, Display Black List. Add a new Exclusion. This may be the full name or a part of the filename. You can choose one of two options: "Begins from phrase" or "Includes a phrase".